Ankrum, Seavey On Stock Car Show Tonight At 7pm – RCO FB Live! 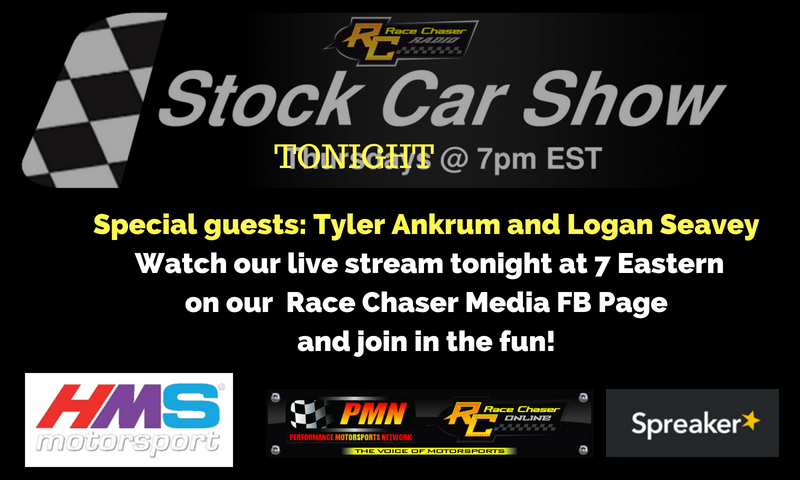 MOORESVILLE, N.C. — Three-time winner and current NASCAR K&N Pro Series East racer Tyler Ankrum and Open Wheel rising star Logan Seavey headline tonight’s Stock Car Show on Spreaker, PMN Radio and our new Facebook live stream on the Race Chaser Media Facebook Page. Tune in as hosts Tom Baker, Jacob Seelman, Chris Murdock and Cisco Scaramuzza break down the weekend’s action and the latest news from around the racing world. Ankrum will join the show to talk about his winning debut this past weekend at New Hampshire International Speedway and a rookie season in the series that wasn’t scheduled to be full-time. Seavey will join the show via the Race Chaser hotline to talk Dirt Derby at Eldora and share his perspective on nearly winning the event in his first time at the track and first time in a NASCAR Camping World Truck Series race, competing for Kyle Busch Motorsports. Listen live for free from anywhere with either the Spreaker App (search Race Chaser Radio) or the PMN Radio App (show plays automatically). You can also watch the full-show live stream on the Race Chaser Media Facebook page beginning at 7pm Eastern time tonight. REBROADCASTS: The show will be rebroadcast on the Performance Motorsports Network on Thursday nights from 9 – 11 p.m. Pacific, Friday mornings from 10 a.m. to noon Eastern and 8 p.m. to 10 p.m. Eastern, as well as the Monday following the show from 12 noon – 2 p.m. Eastern time. ON-DEMAND: The shows will also be available on-demand via the Race Chaser Online Soundcloud channel on Friday afternoon following the show, or on iHeart Radio, iTunes, Spreaker and Google Play by searching ‘Race Chaser Radio’ on any of those platforms. The videocast will be available on-demand on the Race Chaser Online You Tube page after 12 noon on Tuesdays. Race Chaser Media is a full-service audio, video and written content creation company that specializes in, but is not limited to, the Motorsports industry. Race Chaser Media produces and hosts two weekly Motorsports podcasts that air live on their audio partner’s platform, the Performance Motorsports Network (PMN Radio). The podcasts are also rebroadcast on PMN Radio several times throughout each week and are available on-demand by searching ‘Race Chaser Radio’ on iHeart Radio, iTunes, Google Play and Spreaker.